Kevin L. Johnson was born July 15, 1976 in Trenton. Fast, smart and powerful, Kevin was drawn to football as a boy, and displayed the arm strength and leadership to become a standout quarterback. When Kevin was 12, his father passed away. His mother provided a guiding hand, keeping him focused on football and school. He also received crucial guidance from his football friend, Troy Vincent. Kevin arrived at Syracuse in 1995 to compete for the quarterback job, but was instantly eclipsed by Donovan McNabb, who had red-shorted the previous year and knew the team’s offense. Not wanting to squander his athletic skill and understanding of the passing game, teammate Marvin Harrison suggested Kevin join him as part of the receiving corps. Kevin caught 32 passes as a junior for the Orangemen and 60 as a senior in 1998. He was third in the Big East in receptions and receiving yards, and first with 9 touchdown catches. During his college career, Kevin also returned 4 kickoffs and 1 punt for touchdowns. 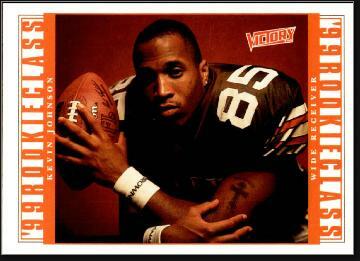 At the 1999 NFL Draft, the newly rechristened Cleveland Browns selected Kevin with their second pick. He caught a 39-yard pass from Tim Couch against the Titans for the franchise’s first touchdown, and hauled in a Hail Mary bomb from Couch against the Saints to give Cleveland its first victory. Kevin caught a team-high 66 passes as a rookie and also scored 8 touchdowns. The following season, he led the team again with 57 catches. Kevin’s best year came in 2001, when he amassed 84 catches, 1,097 yards and 9 touchdowns—all career highs. He turned in another solid season in 2002, helping the Browns earn their first playoff berth. Kevin burned the Steelers in the Wild Card game for 140 yards, but Pittsburgh mounted a 4th-quarter comeback to win 36–33. Kevin fell out of favor with coach Butch Davis the following year and was waived mid-season. Sixteen other clubs immediately pounced on him, and the NFL awarded him to the Jaguars. Kevin played two more years—one with the Ravens and another with the Lions, before calling it a career with 384 receptions, 4,595 receiving yards and 25 touchdowns. He also threw for one score on and end-around, in 2002 with the Browns. After leaving the NFL, Kevin returned to New Jersey and opened a real estate development firm in Hamilton. His first project was a 32-acre fitness and wellness complex called Team Campus, in Bordentown. Kevin has since become a business leader in the Trenton area and a tireless worker in support of numerous charities.